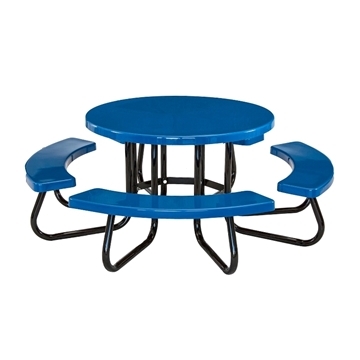 48" Round Fiberglass Picnic Table with Powder-Coated Portable Steel Frame, 205 lbs. Picnic Furniture's commercial fiberglass picnic tables are produced using similar methods to fiberglass boats assuring their high endurance and longevity. Fiberglass picnic tables have smooth fiberglass tops manufactured with a sturdy galvanized steel frame. Our fiberglass top picnic tables are a perfect choice for schools, public parks, playgrounds, swimming pools, and other outdoor areas. Choose the shape picnic table that meets your specific needs from square, round or rectangular. Offered in a variety of gel coat colors to compliment any company or school colors such as shamrock green, champagne, white, red, and many more. In areas where color vibrancy and durability is a top priority, fiberglass tables provide a sleek top and seats for school projects, cafeterias, and lively park environments. Our fiberglass picnic tables are crafted in the USA with a 1-year commercial warranty provided. Call our friendly staff for assistance on any questions you may have about our heavy duty fiberglass picnic tables. Fiberglass Picnic Tables are Great for Poolside! If you are looking for a picnic table for a pool in an HOA or apartment complex, fiberglass picnic tables may be the best option due to their smooth tops and vibrant colors. Fiberglass picnic tables require little maintenance and built with highly durable galvanized steel frames, ensuring to last for years to come in any poolside patio.